Edgar Degas (1834-1917) masterfully depicted ballerinas, racehorses, and the street life of 19th century Paris. He painted in Italy and New Orleans, each place influencing his art. He was a founder of the Impressionist movement, yet refused to be defined by it and held himself apart. 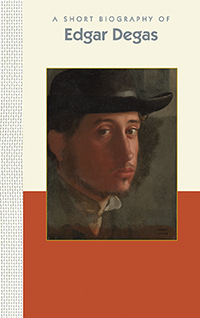 Degas was an enigma and one of the great artists of his time. The Short Biographies series from Applewood's Benna Books imprint features short, intriguing, and entertaining biographies of world-renowned figures. Each beautiful hardcover book includes an interesting retelling of a single person's life, suitable for young adults and adults alike. These little gems will become beloved souvenirs of a favorite artist or a memorable trip to a museum.